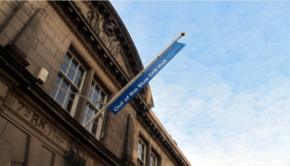 Out of the Blue (OOTB) have developed a partnership with the City of Edinburgh Council in a co-production project to create and manage the Leith Hub project. The project will deliver flexible and affordable workspaces for early-stage businesses and creative entrepreneurs; create employment and training opportunities for local people; animate the town centre of Leith Walk. This will be accomplished by using funding from the Scottish Government and the City of Edinburgh Council to restore the OOTB Leith Walk Studios an “at risk” derelict ‘C’ listed building and bring land into productive use with a converted sea container studio development and street market. The City of Edinburgh Council owns 165A Leith Walk, a C-listed office building, which although in a state of considerable disrepair is currently leased to OOTB who accommodate creative industries organisations and individuals including musicians, painters, writers, and designers. The Council has identified an opportunity to build on this by refurbishing 165A Leith Walk to provide additional workstations for early stage businesses and by using the ground to the rear of the building to provide additional low cost, flexible space aimed at creative entrepreneurs and community users. service providers. Participating users within the space must support the concept of a participatory and accessible space which facilitates sharing of skills and ideas. -The workshop/meeting/teaching space will be used for a programme of projects to connect with the community and other voluntary and statutory organisations at the hub. These projects will be an extension of the established programme OOTB already successfully operate from the Drill Hall. -The community café will be managed as an ‘off shoot’ of the OOTB Drill Hall cafe, providing affordable, healthy food for the local community and the organisations and individuals at the hub site. The cafe would accommodate trainees as part of the OOTB Drill Hall cafe training project. This initiative currently trains 24 people per annum and integrates trainees into OOTB’s creative initiatives and enterprises. -Outdoor space and public areas within the development will be managed to offer opportunities for street markets, events, projects and performances. Key challenges facing Leith that it is proposed to address via this project therefore include supporting the creation of new jobs in the creative sector, including providing workspaces, and delivering services to a fast-growing population. 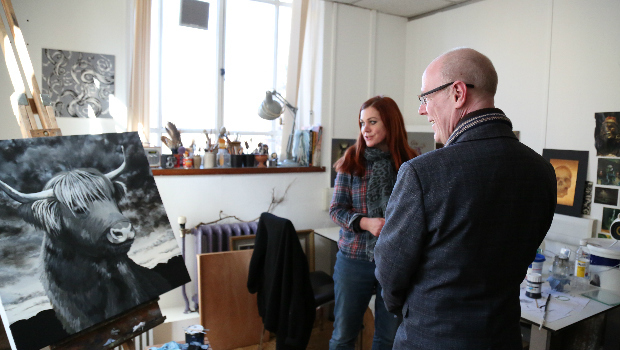 Photo: Kevin Stewart MSP and Out of the Blue Leith Walk Studios artist Rona Innes.